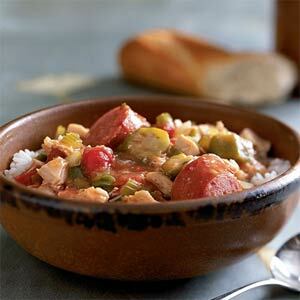 Chicken and Sausage Gumbo | What's Cooking at the Genua's? First let me say that I have not actually made this recipe yet. But I will, soon. My husband loves gumbo. Me, I could take it or leave it. Mainly because there are peppers in it. Remember, I am the one Italian who doesn’t like sweet peppers. I know, weird. But I am willing to give this a try and I will make sure I chop the pepper very small so I can’t pick them out! You should see me at restaurants! Anyway, I got this recipe in my email today from Cooking Light. It’s actually from their November 2002 issue! So it’s been around a long time. I have changed a few things of course (though I am leaving the peppers in!). The recipe calls for boil-in-bag rice. Not happening in this house. I will use jasmine brown rice. I always make a huge batch and freeze it in small packages, for occasions just like this! And it also called for turkey kielbasa. I will use chicken sausages of some kind. The recipe originally called for bottled minced garlic. Again, not in my house! I will use fresh garlic and probably double it! What is also really great about this recipe is that most of it uses frozen vegetables. This will save time if you’re making it last-minute. But if it’s last-minute you might not have the ingredients on hand so think ahead anyway. And if you do not like to use frozen vegetables like onion, peppers, okra etc. use fresh. But remember the frozen ones are already all cut up for you and cook faster! Another way to make this a little different is to add some shrimp to the last step also. Probably about a half pound or so of uncooked. It will cook fast so be careful. 1. If you are cooking rice now make the gumbo while it is cooking. 2. Combine the flour and oil in a Dutch oven or large soup pot. Saute over medium-high heat for about 3 minutes. Add the onion, green pepper, okra, celery, garlic, thyme, and ground red pepper. Cook for about 3 minutes or until tender, stirring frequently. 3. Stir in the chicken, sausage, tomatoes, and broth, cook 6 minutes or until thoroughly heated. Serve over rice. This sounds delicious! I was just trying to decide on a soup to make for dinner next week (I know, It’s not even the end of this week LOL)… Jake recently told me he “doesn’t like the sound of okra,” but he’s never tried it… let’s see if he likes the taste of it! Yeah okra can be a little scary if you’re not used to it. I’m not! I was scared too at first but it’s not really bad. Hope he likes it! Okra is big in my family and I have always a lot of supplies of it in the freezer. Always looking for new recipe to surpirse my family. I know this one will be a big hit. Great job. Hope they like it! Thanks Faith!